“Luther was not a monk,” Mr. Marty says. “He often called himself a monk, but he was an Augustinian friar. Monks were Benedictines; they were cloistered. They did a lot of good spiritual work, but the friars were out there with the people, ringing bells, raising money.” And that experience of being among the people, he notes, handed Luther a cause that would not only shake his faith, but transform the Christian world. Mr. Marty is a professor emeritus at the University of Chicago Divinity School, an ordained Lutheran minister and one of the nation’s leading scholars on religion. His latest book, October 31, 1517: Martin Luther and the Day that Changed the World, offers an insightful look at the Reformation and why Luther, a spiritually troubled clergyman from an obscure village in Saxony, had such a resounding impact on Christianity that continues to this day. Which leads Mr. Marty to his second bit of breaking news: “Lutherans and Catholics are on the way to greater unity." And that is perhaps the main reason why commemorations have begun a full year before the actual 500th anniversary of Luther’s “Ninety-five Theses.” On Monday, Pope Francis joined Lutheran church leaders in Sweden, a country that had banned Catholic convents until the 1970s, to launch the celebrations. The pope expressed his hope for further reconciliation with the worldwide Lutheran church. I spoke with Mr. Marty at United Lutheran Church in Oak Park, Ill., just outside of Chicago, where he had come to reflect on the five centuries since the “Ninety-five Theses” were published. The “Ninety-five Theses,” he says, were revolutionary in their contention that repentance “cannot be understood as sacramental penance…performed under the ministry of priests,” but Mr. Marty maintains they were also just the tinder in a conflagration that had long been building. Luther’s challenge to the authority of the church followed years of growing discontent over the sale of indulgences as a way of ensuring either one’s own or a loved one’s entry into heaven. In truth, indulgences were the financing engine for the construction of St. Peter’s Basilica in Rome. It was a fact, Mr. Marty says, that hardly sat well with hard-working German Catholics who had begun to bristle under their church’s central control from a distant city. “They were ready for a big change, a total shift,” he says. Luther condensed this yearning into a single little phrase: justification by grace through faith. Luther, as depicted in Mr. Marty’s book, seems to be an accidental revolutionary. He was given to late-night bouts of anxiety and constantly fretted over his own transgressions. He was so obsessive that his spiritual director once chided him for feeling that he had to confess every incident of flatulence he experienced. The image of Luther in his black clerical robe announcing his “Ninety-five Theses” with the dramatic gesture of nailing them to the door of the castle church in Wittenberg is engrained in history. But Mr. Marty argues in his book that this event is likely apocryphal. He says Luther was acutely aware of church authority and first sent the theses to his presiding bishop. “He was thoroughly convinced that when the bishop read his theses that the scope of the scandal of these indulgences would reach him and he’d kick out all the indulgence sellers,” he says. But the rest is history. 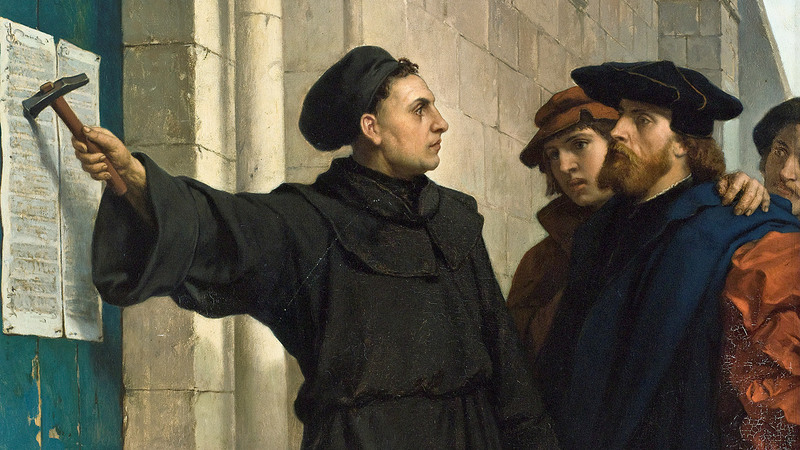 And it is history too that has vindicated Luther to a large extent, Mr. Marty argues. While there remain major areas of disagreement, the Roman Catholic Church indeed, after the Second Vatican Council (which Mr. Marty covered as a journalist), adopted some of Luther’s ideas, including communion under both kinds and Mass in the vernacular. In a 1999 document known as the “Joint Declaration on the Doctrine of Justification,” the Catholic Church moved toward accepting Luther’s insistence on salvation through faith. Much (though not all) of the Lutheran Church has come to embrace a role for good works on the path to salvation. Despite the monumental shifts that gained full momentum in 1517, Mr. Marty maintains “the Reformation is only partly finished.” The church, he says, is always in a state of “becoming.”Still, Luther’s impact cannot be minimized. In a survey done on the 500th anniversary of his birth, Luther was found to be one of the three most written about figures in history, the others being Napoleon and Abraham Lincoln. His writings fill 130 volumes. The faith tradition he founded continues to spread. Today, the second largest Lutheran country in the world after Germany is Tanzania. Ethiopia is third. Indonesia and India are in the top 10, as is the United States. But what Luther began continues to face new challenges. In his day, the question was, “Is God gracious?” Mr. Marty says the more likely question Luther would face today is whether God even exists. In the traditional Lutheran strongholds of Germany, Sweden and Iceland, the vast majority of the population still self identifies as Lutheran, but the pews on Sunday remain largely empty. These are challenges Mr. Marty suspects Luther, if alive today, would revel in addressing. He would likely offer as an antidote his vision of a God who is caring, just and merciful and offers our salvation as gift. Judith Valente is America's Chicago correspondent.